Lol, spacey speed, you like that? Good because we're going to keep this trip to the stars going. Greek speed/thrash space bandits Sacral Rage I've only heard from whispers in the galaxy and barely a solar tendril of their sound has ever come to my ears until Beyond Celestial Echoes. The album has received praise from some important critics and it is rather easy to explain using cosmic references. Somehow they found a way to ride the glitzy space-board theme sarcastically, or I'm simply misreading them and giving myself an excuse for liking something I would usually despise. I mean look at that space war cover by Dimitar Nikolov. If that doesn't make you want to surf stardust and liberate Pluto to make it a planet again quit this site now. You can hate me for it, but these guys have convinced me riding to the stars with laser swords while breaking the no-sound-in-space barrier is something I should do. See what it's already done to me? I'm spurting out a thesaurus of glittering words that have just reduced this site's worth by 50%. For once it actually doesn't matter and you can return that 50% to the pot and wait until I sell out another day. Speed and thrash have really lost themselves in pulp-cover themes this past decade and anything involving space usually falls into its own black hole in a single track. 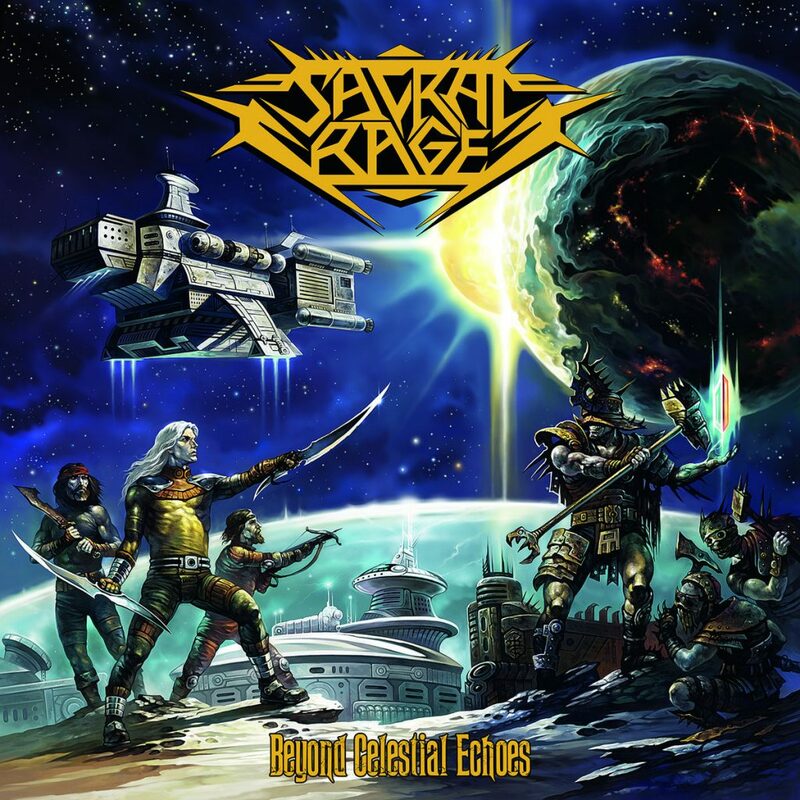 Beyond Celestial Echoes, however, succeeds because Sacral Rage could really give a crap how ridiculous the idea is because they completely devastate those damn riffs. The guitar and bass work here is comteous, for lack of a better space word. Every song has something that makes it stellar and the expected, shrill vocal falsetto actually heightens the sound instead of smothering it with dark matter. A perfect example of this is at the 3:47 mark in "Samsara (L.C.E. )," where they pull out a successfully epic run that, in spite of its thematic silliness, like the rest of the album dwarfs the North Star and makes a new Christ. Check out their back catalog as well, though this is my favorite.